7 Kids and Us: Oral I.V. The Easy Way to Get Your Daily Water! We all need water. Our body has to have it. Recently I was sick, really sick, and the walk in clinic sent me by ambulance to the hospital where I was immediately given an I.V. of fluids. I can't even explain how much having fluid in your body makes you feel better. I couldn't walk when I got to the ER, but within 10 minutes of having the fluids, I was walking around. Oral I.V. is what I rely on now. 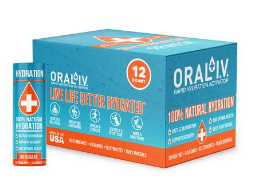 Every morning and later in the afternoon I drink one 2.2oz bottle of Oral I.V. along with 8-12oz of water, yeah you gotta drink water but really it is not that much. Your body makes good use of the water (better absorption rate) it has and the water you drink with and after consuming Oral I.V. There are no stimulants, no flavoring other than mineral tastes, nothing that makes your mind think you need to “feel” in order for it to be working. Trace minerals in the Oral I.V. 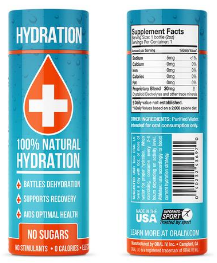 formula affect your body's hydration at the cellular level. Making you be a better you healthier you all around. The Oral I.V. also is great for kids going back to school, great way for them to start the day and be awake and focused. You can find Oral I.V. by visiting their site here.